Mother-nature has blessed the Washington, DC area with 89 degrees weather. In 89 degree weather, a white wine is choice on a hot day. When folks say it’s too hot for red wine, I explain that you can enjoy a glass of red wine on the hot day, “just go inside and turn on the A/C:). My plan was to begin the day sipping on Yalumba Organic Vioginer. Well…I will tell you that I’m just having that glass of Vioginer and its 12:05am. Yes, this is not a typo “am”. One part of my plan did occur, which is today was definitely a “white” day. When visiting a friend, who is a wine novice, I dare not bring a bottle of red wine. This is the same woman who only served “plum” wine at a gathering, YUP! So, being a good guest, I decided to bring Freixenet champagne and kiwi strawberry juice to make mimosas. I arrived with a warm greeting and followed with the comment “What’s this?” while I handed her the bag of champagne and juice. I said to myself “what did I do wrong; I just got here?” I graciously explained “Freixenet its champagne and I thought we could make some kiwi-strawberry mimosas”. I received the dreadful response, “Oh, so early in the afternoon?” Ladies and Gents, it was 4:00pm. OMG!! Not that I’m a lush, by this time, on a beautiful Saturday day, (okay beautiful day wouldn’t matter:)) I would be on my second, maybe third glass. I was silent, afraid my OMG scream would be heard if I opened my mouth. My wine drinking rule has always been “as long as its double-digits, it’s okay to have a glass of wine; isn’t this why most vineyards open at 10:00am (Shaking My Head). An hour passed, before the host pulled out a bottle of (drum roll) Glen Ellen Moscato. I may sound like a snob, but when it comes to wine, perfume, shoes and handbags, I can be snob. So, she pulled out the Glen Ellen and I smile the best genuine smile possible. I say, “What’s this… a bottle of Moscato.” I don’t know what my facial expression showed; but based upon her response “You don’t like it?” I said “Oh no, (shaking my head) I usually don’t drink sweet wines, it goes straight to my head”. Guess what! I was pleasantly surprised. It wasn’t as sweet as I expected; it was nice. Would it be my choice of wine to sip on all day with friends, on a patio, or in a hot tub :)? NO. But, to be a polite guest, I sipped on my glass of Moscato and had a good time. By the way, the Yalumba Vioginer (made with organic grapes) stood up to its name. It has a beautiful brilliant lemon-lime color; it sparkles like a jewel; aromas of citrus fruit with a slight hint of peaches and a clean fresh taste with a creamy subtle buttery finish. 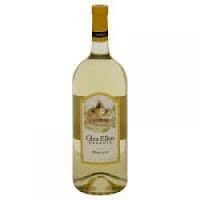 Being a red wine lover, its fun broadening my horizons and finding some delicious white wines. I learned that having an open mind can be enjoyable.